Last week I had the privilege of interviewing 2008 Olympic Gymnast, Samantha Peszek. We talked about her 3 rules of beam and how she became a “Beam Queen”, the mindset hacks she used to help her become a champion and how she had several strategies to help her “be all in”. After talking to her, I left our conversation with the impression that she is an extremely driven, positive, giving person and I know the information she shared with me is going to be super valuable to all of you! I’m so excited to share these tips with you today that will help you become a better gymnast. But first, let me give you a little background on Samantha Peszek. She was born in Indianapolis, Indiana. She first became excited and inspired to become a great gymnast after watching the Magnificent Seven win the first team gold medal for the US during the 1996 Olympics. After 12 years of commitment to her goal, she was chosen to be on the 2008 US Olympic team going to Beijing. Unfortunately she had an ankle injury during warm-ups in Beijing and was only able to compete Bars. After she returned home from the Olympics, she recovered from her injury and then continued to compete as an Elite gymnast. She continued gymnastics in college where she competed for UCLA. She capped off her gymnastics career by winning gold at the 2015 NCAA All-Around Championship her senior year! Currently, Peszek is still committed to the sport with her traveling Beam Queen Bootcamp, which is a 2-day clinic just for beam! At her Beam Queen Bootcamp she hopes that gymnasts not only improve their beam skills, but that every participant leaves a more confident gymnast. The first rule of beam is to always keep your eyes at the end of the beam. This rule sounds so simple, but keeping your eyes at the end of the beam will help you stay solid, centered and will likely help you eliminate wobbles! The second rule of beam is to find your arms. You want your arms to be doing the same thing as each other, and you want what they are doing to be in alignment with what the rest of your body is doing. As Peszek explains, “a lot of times you wobble or you fall, because your arms aren’t in sync with each other”. So when you find your arms, you want to consciously make sure your arms are doing what they should be, and that they are doing the same thing (ex. you don’t want your left arm lower than your right). 3. Go to Home Base. Peszek says the third rule of beam is to get to home base. She compares this rule to safety zones in freeze tag. In freeze tag safety zones are where you go so that you can’t get tagged out. Peszek explains that similarly every skill has a home base position on beam, where if you’re in that position you will be safe from bobbling or falling. For a back walkover, it’s a lunge or beam feet. For a jump, it’s with your legs together but slightly bent. To follow this rule, after you complete each skill in your routine, you want to immediately find that skill’s home base position to prevent bobbles and balance errors. Peszek shared some mindset tricks she used to keep herself motivated to keep pushing forward in her goal of becoming an Olympic gymnast. These tips are great ways to help you stay inspired to reach your goals. Peszek says that when you are working out long hours, and doing tons of conditioning it’s not always fun. And during these not so fun times it’s important to remember your “why”. Why do you do gymnastics? Whatever the answer to that question is, is your why. For Peszek, her “why” was that she loves the sport and she loves the challenge. 5. Are you in or are you out? And the decision was always just so black and white for her. She was in. And if she’s “in” then she’s going to give it all she has. Peszek says that if she is going to be at the gym for x amount of hours anyways, “I’m never going to not give 100%”. She stresses that she was always black and white about everything. If she’s committed to a goal, then she’s in and giving 100%. If you’re committed to a goal in life, whether it’s in gymnastics or school, you might as well give 100% of your effort, so that you won’t be disappointed at the result. Peszek says that in college she started to get frustrated when everything wasn’t perfect during practice. And with a 4 hour practice, you can’t expect everything to be perfect. Not every turn you take will be perfect. Expecting that is too much pressure to put on yourself. Setting a goal of one thing she would improve upon next practice: Whether it was getting her legs straight on a skill, or choosing quality over quantity, or sticking one of a certain skill, she would set a goal. Telling herself one thing she was proud of herself for that day: This could have been that she fell on three of a skill in a row and didn’t get down on herself about it, or that she did extra core conditioning. This is such a great, positive way to end practice. 8. Cultivate your essential inner voice. Peszek mentions how she used to have a pre-meet routine of playing loud music in her ears to drown out all the noise in the arena where she was competing. She did this so that she could hear her “essential inner voice”. In order to cultivate your inner voice, she advises that you should try to remember what you were thinking when you did a skill right. Whatever you were thinking that helped you nail that skill, should become part of your routine’s mental choreography. String together these thoughts so that you not only have physical choreography that you go through during your routine, but thoughts that you tell yourself while you are doing all of the skills. I asked Peszek if she had a method for visualization, and she gave us a great tip! She said when she was a young gymnast she had a lot of fear. It was hard for her to visualize herself doing a skill that she was afraid to do. So she started to visualize a teammate that could do the skill well performing it perfectly. Then she would put her face on her teammate’s body in her mind to be able to visualize herself doing the skill. Later on in her career, she got into the habit of trying to visualize one perfect routine before bed. She wouldn’t go to sleep until she had visualized it perfectly. So whether you have no trouble visualizing yourself doing skills perfectly, or need to figure out a trick like Peszek did, you should get started today creating your own mental workout! 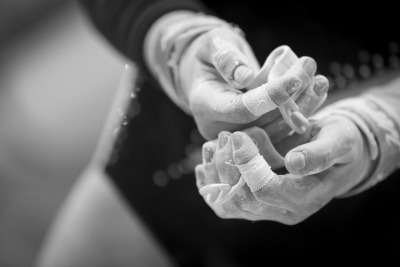 These top 9 tips are for most gymnasts. They will help you improve and become a better, more confident gymnast. The next 2 tips are only for the extremely committed gymnasts, that want to be “all in”. If you start reading them and they aren’t for you, skip to the end! Peszek shares some tips from several times in her gymnastics career when she was “all in”. The first “all in” tip is one she got from her coach at UCLA, Miss Val. Miss Val talks about the concept of RAW- Ruthlessly Attacking your Weaknesses. You can see more in the video above. I asked Peszek about how she practiced RAW, and she said that not only did she ruthlessly attack her weaknesses when she was healthy, but she did when she was injured also. As a healthy gymnast, she explained to me that she wasn’t the most flexible, she was always more of a powerful gymnast. So she started going to hot yoga to attack this weakness. Hot yoga helped her become more flexible and limber. She also practiced RAW during periods of time when she had an injury. For example she cracked her tibia in her knee early on in her Elite career, but while she was injured she would still go to every single practice. She would sit in splits and do conditioning and visualize for 4 hours. She says she feels like this time attacking her weakness (her injury), really helped her get ahead. Because when her injury healed, she was stronger than she was before from all the conditioning, and she was also mentally ready to perform the skills that she had been visualizing. Peszek says she did this concept of becoming a 24 Hour Athlete really well when she was training for the Olympics. She called it her “bubble life”. She was going to a regular high school, and had non-gymnastics friends at school. They were going to parties and eating junk food, but she couldn’t do that if she wanted to reach her goals. In her bubble life, every single thing she did from morning until evening was to help her become the best gymnast she could be. Every single meal, every single thing that she did was to help her achieve her goals. This meant eating her vegetables (which she hated) and getting enough sleep. After the Olympics she got away from her 24 hour athlete bubble life, until she tore her Achilles tendon. She said to herself if she was going to get back into the sport, she was going to be “all in” like she knew how to do when she was training for the Olympics. So she recommitted to her bubble life (she talks about this in the video above). She ate spinach (which she hated) because she read somewhere that it helps heal your body quicker, and she went to yoga to help with her flexibility even though it cost extra money. With this re-commitment she became the best college gymnast in the country, winning the NCAA championship gold medal her senior year. If you’re committed to the sport of gymnastics, and want to become the best gymnast you can be, then take a look at what you’re doing from when you wake up in the morning until you go to sleep. What can you do to become a 24 hour athlete? Eat your vegetables? Practice at home ? So how do you Implement these Tips? 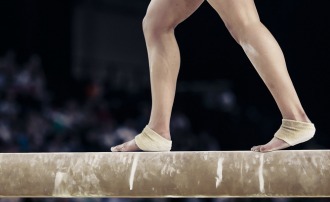 Before you can implement these tips, you should figure out what your goals are with gymnastics. Then figure out which tips are most important for you to embrace. If you want to become a better gymnast when you go to the gym, then you should start practicing the 3 rules of beam, and also the habit of telling yourself something positive when you leave the gym, along with setting a goal for the next practice. If you have lofty goals of becoming a great gymnast, then start thinking about what you can do to practice RAW, and become a 24 hour athlete. If you are completely loving these tips like I am, then you can think about signing up (or getting on the waitlist) for a Beam Queen Bootcamp. You can also check out Samantha Peszek and Beam Queen Bootcamp on instagram. Read it to my daughter Cindy and she enjoyed it. She’s on a mission to find the home base in her beam routine. These tips are AMAZING! I love tip #7, set a goal and think of something you’re proud of yourself for. I will definitely think of these for my next practice at the gym.